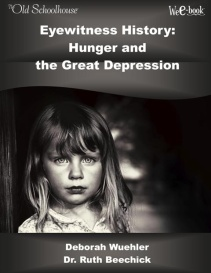 I am honored to have been chosen by the Schoolhouse Review Crew to do a review on a short EBook called Eyewitness History: Hunger and the Great Depression by Deborah Wuehler and Dr. Ruth Beechick. This book can be purchased for a very reasonable price here at the The Old Schoolhouse Magazine. From the moment I started reading this to my ten-year-old son, he was hooked on it. Even though this is a fairly short book, compared to a chapter book, he, and I, both enjoyed it. The book covered the story and history of the Great Depression. It also covered our own spiritual depression and how to learn from both of these experiences. The book talked about how frugal people needed to be during that time period and how nothing was wasted or thrown out. The resilience of our country during this time period is amazing. Dr. Ruth Beechick shares her personal experience of what her family went through during the Great Depression in the book. She has a way of writing it that allows you to feel like you are there experiencing it with her. I found it fascinating that a lot of what was written about in the book is now becoming popular again with people in our country. People are wanting to return to their roots and learn how to become self-sufficient again. I have always been a great listener of my grandparent's stories, even though they were born at the end of that era, they were raised by parents who survived it, and my great grandparents passed those skills on to my grandparents. My grandpa and grandma have taught me how to can produce and helped me start hunting deer. They are the true pioneers of self-sufficient living. The book explains how the 1920's were a time of excess, prosperity, and enjoyment. Following these years is when the Great Depression happened. I can't help but think about our modern day excess in all areas of life and wonder if perhaps the same fate, although in a different way, will come upon us again. The book then goes on to cover spiritual depression. "Though the Great Depression created a never-give-up spirit, a "spiritual depression" creates just the opposite: apathy." Ironically, or not, if you know how God operates, the section on the spiritual depression spoke straight to my heart, as I was reading it aloud to my son. Life seems to have a way of making you so busy that God's Word is put on the backburner while other matters take front place. I was reminded once again, through this book, that I need to make time for God's Word, even if I do not feel like it. After I was done reading the book to my son, he asked me to read more. I told him there was not anymore to read, but, perhaps we could check out some books at the library on the Great Depression. I feel this EBook is worth reading, and it is very reasonably priced. It will spark interest to further research that time in our country's history and teach your children about frugality, living intentionally, and how to use your resources wisely. Please comment below if you have read, or are thinking about purchasing, this EBook for your homeschool.